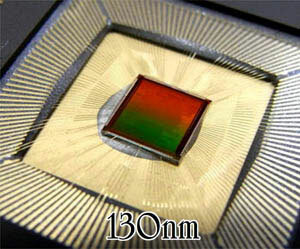 This cryptographic IC chip was fabricated by using the 130-nm TSMC standard cell library. ISO/IEC 18033-3 standard block ciphers AES, Camellia, SEED, MISTY-1, CAST-128, a defact standard DES, and RSA public-key cipher are supported. The key size for an export version is limited as 56 bits for the block ciphers and 512 bits for RSA.